DNA Exonerates Man Who Served Nearly 40 Years For Murder : The Two-Way Joseph Sledge, now 70, spent 37 years in prison for a crime that a three-judge panel said Friday he did not commit. 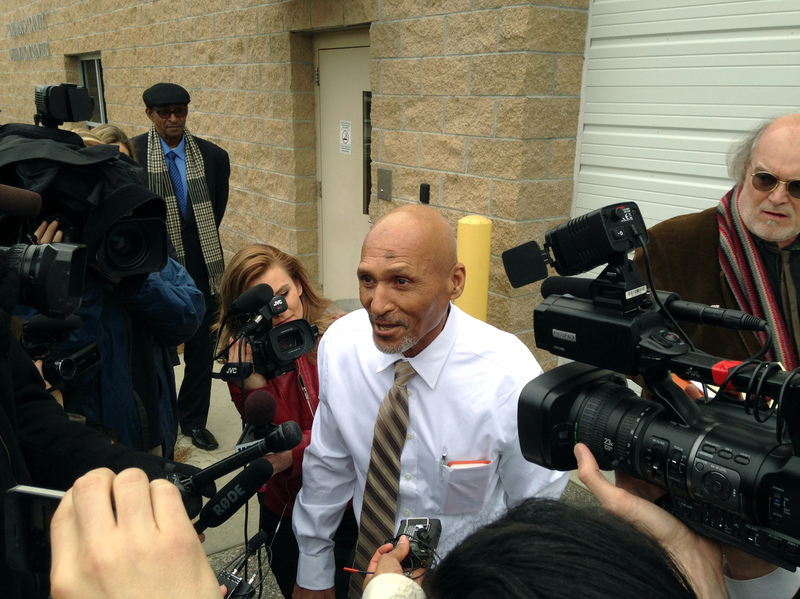 Joseph Sledge, 70, addresses members of the media after being released from jail in Columbus County, N.C., on Friday. He served nearly four decades behind bars for two slayings he didn't commit. Joseph Sledge is a free man after 37 years in prison following Friday's decision by a judicial panel in North Carolina to overturn his 1976 conviction in the stabbing deaths of an elderly mother and her daughter. The Associated Press says DNA evidence had helped to exonerate Sledge, now 70, whose case was referred last month to the three-judge panel by the North Carolina Innocence Inquiry Commission. "The expert said none of the evidence collected in the case — hair, DNA and fingerprints — belonged to Sledge. A key jailhouse informant had also recanted his story, saying authorities promised him leniency in his own case for his trial testimony against Sledge. "A district attorney who was not originally involved apologized to Sledge and promised to reopen the investigation.
" 'The system has made a mistake,' district attorney Jon David said." " 'There's nothing worse for a prosecutor than convicting an innocent person,' he said. "Earlier Friday, a member of the Davis family took the stand, saying the family is 'heartbroken' by the decision that Sledge go free. "Sledge then took the stand.
" 'I'm very, very sorry for your loss,' he said. 'I hope you get closure in this matter.' "
WRAL says that at the time of the murders, "Sledge had been serving a four-year sentence at a prison work farm for larceny when he escaped a day before the slayings. That factored into his conviction, as well as key testimony from two fellow prisoners who said Sledge admitted to the killings." Raleigh's News & Observer reports: "Sledge has been proclaiming his innocence of the murders of Josephine and Ailene Davis since he was initially blamed in 1976. From the start, he has asked prosecutors, police and judges to take another look at his case. It took nearly four decades for the justice system to correct its mistake." Sledge reportedly planned to have dinner at a restaurant before returning home to Savannah, Ga. He said he looked forward to sleeping in a real bed for the first time in nearly four decades.